LONDON--(BUSINESS WIRE)--Technavio market research analysts have predicted the global follicular unit extraction systems (FUE) market to grow at a CAGR of more than 6% during the period 2018-2022, according to their latest report. A key trend being witnessed in the market is the growing focus on product innovation. With the growing competition in the global hair restoration services market, the hair restoration service providers are increasingly concentrating on the R&D and marketing to improve the hair restoration processes and procedures. Hair restoration centers and clinics are increasingly investing in product innovation and development to effectively maintain their market position. This is expected to drive the adoption of motorized and robotic FUE systems. In addition, the marketing campaigns of the hair restoration clinics and hospitals are incorporating innovative technological solutions into the marketing mix to stand out in the market, differentiate their offerings, and attract more customers. The global hair restoration services market has been growing rapidly due to the increased hair loss phenomenon, particularly among the millennials. Some of the major factors contributing to the increasing amount of hair loss are the elevated levels of stress, hormonal changes, thyroid disorders, autoimmune diseases, hairstyle treatments such as straightening and bleaching, and improper diet structures. Hair loss is increasing equally among men and women, and the increasing need to maintain youthful features is driving the demand for hair restoration services. This market research report segments the global follicular unit extraction systems market into the following products (non-robotic and robotic), end-users (transplant and dermatology), and key regions (the Americas, APAC, and EMEA). It provides an in-depth analysis of the prominent factors influencing the market, including drivers, opportunities, trends, and industry-specific challenges. The Americas was the leading region for the global follicular unit extraction systems market in 2017. It held a market share of more than 49%. The market share occupied by this region will decrease by nearly 4% during the forecast period, however, it will continue to lead the market through 2022. Of the two major products, the non-robotic segment held the largest market share in 2017, accounting for more than 95% of the market. The market share of this segment will decrease by nearly 6% by 2022. However, this product is expected to dominate the global market through the forecast period. 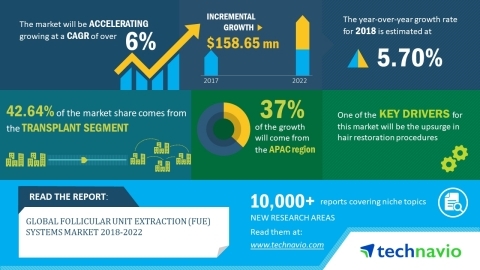 Technavio market research analysts have predicted the global follicular unit extraction systems market to grow at a CAGR of more than 6% until 2022.